I've lived in Maine for 10 years, and I grew up in Southern California. When I was a kid I always had a dog, but as an adult the timing hasn't been right until now. We've finally bought a house with a few wooded acres, very secluded and private. I love it! We share our house with 3 cats and 2 guinea pigs. Our cats are a bit older and have never had a dog around, so it might be a challenge at first to bring the puppy into the household. But I know we can work through any problems. I'll probably look to this site for a lot of advice! I've loved corgis ever since my mom had one when I was in high school. Kaydee was the best dog! We've had many dogs before and they were all special, but I don't think another had quite the impact that Kaydee did, especially on my mom. I think this site is fantastic, it's very informative and everyone seems very friendly and helpful! Penny was born on March 18, 2008. She is such a good dog, super smart! She has really mellowed out in the last few months and is doing a lot less puppy-biting. We really enjoy going to Coastal Corgi meetups in New Hampshire. I just wanted to put this picture in a blog because I think it is so cute. 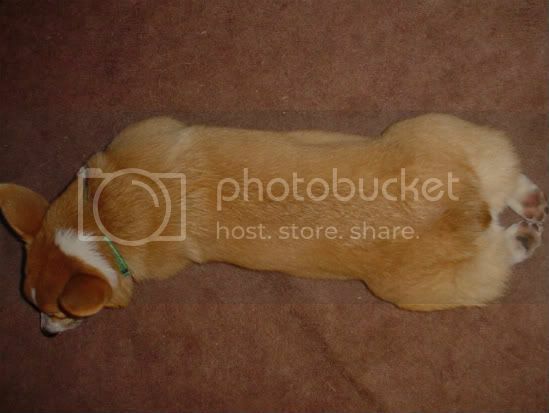 I've seen plenty of corgis stick their legs out behind, but never so that the toes are touching! Actually this blog will probably be about more than just camping, since I haven't written in awhile. So if it's lengthy, I apologize! Penny is doing great! Her ears are up, they've been up for about a week or two now. Hi Caitlin and Penny. Marley and I enjoyed meeting both of you in Kingston. Penny is such a sweet girl. It was nice meeting you folks also. I hope you can make it to the Meetup in Kingston. It actually not that much further than Hampton for you. Continue down 95 to the Hampton Tolls then on to NH 101 - all highway. The Meetup location is about 10 Minutes off of 101. You have a Penny too! Yay! I want to say he was 3 months old, maybe older. I do remember they went up somewhat late, as I was wondering when they'd go up. They went up, then crashed back down for a few days, then went up permanently a few days later. I know they weren't up when he was 12 weeks. Welcome Caitlin! Congrats on your upcoming new furry addition to the family! You're in for a treat!